Happy Monday kids.... for many of you (at least in Texas) the first day of school is today so you are probably home relaxing after what has been a super full morning. The perfect time for the Great Monday Give, no? Mondays are the days I gift an old kids' book from our collection to one lucky reader. 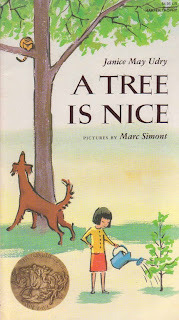 Today's give is a 1987 edition, lightly pre-loved paperback copy of a wonderful classic A Tree Is Nice. Great, great book. To be entered to win, simply comment on this post before midnight, Sunday August 30th. A winner will be selected randomly and announced the next day. As for last week's give of Sam, Bangs & Moonshine, the winner is Jen (Pink) Williams. Sorry it took so long and congrats! Send me your info to webe(at)soon(dot)com. And thanks for reading everyone! See you with a review shortly. Oh, this is a sweet one! Thanks once again for a chance to win a great book! This looks lovely, another one I haven't seen before...Thanks for sharing my wishlist is getting really long thanks to you! I love it. I love its shape. I love its illustrations. Love its story. This one has been on my wish list for a while. Pick me!! Awesome. This looks like another great book. No way! This is one of my absolute favorites. I'm even planning to use it in a give-away on one of my blogs soon! Just found your blog and love it! Thanks for the chance to win. This is a lovely book. I have not read it in years! I've never read this one before, but it sounds great. What a perfect-looking book! Thank you so much for your blog--reading it is one of the highlights of my day, as an information professional who deals only with metadata at work. Thanks a million!! I really like nicely illustrated books (we're a big fan of the "Davy" books by Brigitte Weninger, in part because of the beautiful illustrations). This looks like one we would love too! I would love to give this to my grandson! Thank you for the giveaway. I've never read this one, but it looks perfect to share with my son! Thanks for the chance to enter!